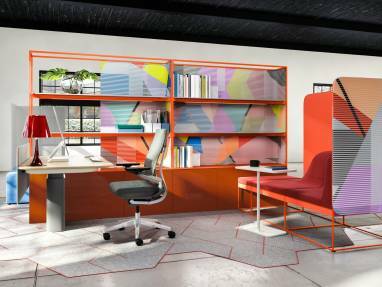 The newly expanded and redesigned Steelcase Chicago WorkLife experience, which signals a new day in workplace design, has been awarded Best Large Showroom and Best of Competition at NeoCon 2018, North America’s largest design exhibition and conference for commercial interiors. 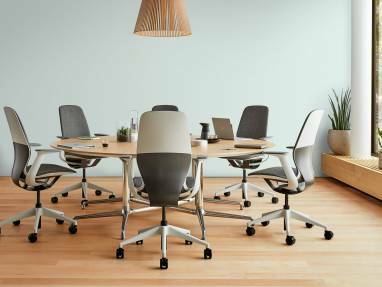 Honors for Steelcase and its family of brands also include six Best of NeoCon Awards, an Interior Design HiP Award and a #MetropolisLikes Award. The 2018 Steelcase showroom brings together Steelcase, Coalesse and Turnstone, along with an extensive new network of partners for the first time. Two distinct areas complement one another and highlight a new vision for the future of work. The Steelcase WorkLife demonstrates how a ‘smart + connected’ workplace can improve the employee experience and drive innovation, and the all-new Steelcase WorkCafé features a dynamic ecosystem of spaces designed to support the wellbeing of people and foster connections at work. The new experience earned Steelcase top honors as Best in Competition and Best Large Showroom category winner in the IIDA/Contract Magazine Showroom and Booth Design Competition. Steelcase was awarded Best in Competition in the IIDA/Contract Magazine Showroom & Booth Design Competition and was also named the Large Showroom category winner. This annual competition, sponsored by the International Interior Design Association (IIDA), in partnership with Contract Magazine, honors outstanding creativity in corporate branding initiatives for showroom and booth design at NeoCon. 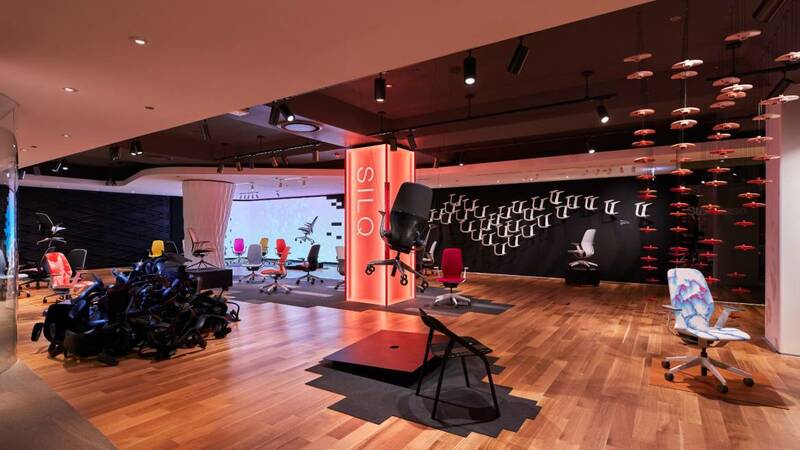 SILQ by Steelcase Design Studio won Best of NeoCon Innovation Award, presented by Contract Magazine, in the Seating Conference & Seating Ergonomic Desk/Task category. A breakthrough in seating design, its patent-pending material composition and new manufacturing process is redefining the office chair. It is now available to order. Mackinac (pronounced MAK-uh-naw) by Steelcase won a Best of NeoCon Innovation Award in the Furniture Collections for Collaboration category. Mackinac offers a range of furnishings that support the accelerated pace of work to help people move, think and feel better. Its unique, height-adjustable cantilever work surface allows people to quickly shift between focused work and collaboration without leaving their workspace. Embold by Steelcase Health won Best of NeoCon Gold in the Healthcare Guest and Lounge Seating category. Embold is a collection of seating and tables that combine beauty with accessibility, while offering a variety of sizes and material options. Designtex, a Steelcase brand, was awarded Best of NeoCon Gold for Surroundings in the Healthcare Fabrics & Textiles category. Surroundings is a healthcare textile collection centered around the patient experience. The textile designs featured in the collection balance high-performance and calming aesthetics to offer added psychological and physiological benefits through the use of biophilic design elements, visual refinement, and innovative Celliant® technology, an FDA-determined wellness product. Designtex also won Best of NeoCon Gold for Celliant in the Textiles: Upholstery category. Celliant is a responsive textile made with patented, cutting-edge fiber technology that incorporates a proprietary blend of thirteen thermo-reactive minerals. These minerals reflect naturally emitted infrared energy back to the user’s body to provide performance, health and wellness benefits. In addition to Best of NeoCon, SILQ also received a 2018 #MetropolisLikes Award, selected by Metropolis editors and a Grand Award in Product Innovation from BUILDINGS Media. SILQ was also honored by the fifth annual Interior Design Honoring Industry People & Product (HiP) Awards, which celebrates commercial industry pioneers and their achievements. SILQ received the award in the Workplace Seating: Task category. 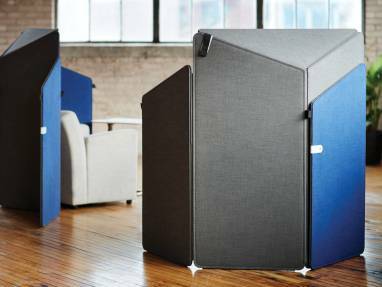 Turnstone’s Clipper was named a finalist for the Interior Design Honoring Industry People & Product (HiP) Awards in the Workplace: Partitions & Walls category. Clipper’s ’s portable screens provide on-demand privacy and are available in either a 72 or 56-inch height, covered in fabric with optional contrasting colors, a magnetic closing system and handles for easy portability and storage. For more photos and product information about the award-winning and innovative solutions for the workplace seen at NeoCon 2018, visit It’s a New Day.